They say that new is well forgotten old. This is exactly what one can tell about ganutell. 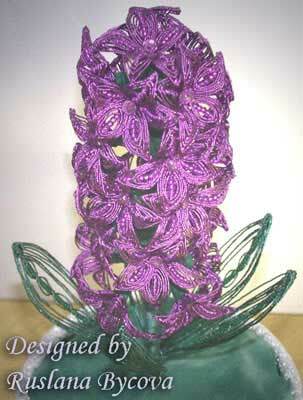 My story is about the ancient art of making flowers. Artificial flowers have always been used in interior, they decorate clothes, and flowers give special charm to fashionable ladies' hats. Such flowers are used everywhere, in all kinds of situations - beginning from weddings and finishing with funeral. But we shall not talk about sad... We shall better talk about pleasant. How are these flowers made? Such flowers are usually made of a rigid fabric or paper, sometimes they are knitted, and are frequently made of plastic, leather, clay, silk ribbons, seed beads, sea-shells, ace, and even from female stockings already... Don't laugh! Such florets are the most gentle! On the island of Malta , which is in the Mediterranean Sea , not so far from the Italian shores, one more traditional way of manufacturing flowers, called Ganutell, is known. Most likely this technique was earlier known in other countries as well, but at the moment it is preserved exactly in the monasteries of Malta . Maltese nuns still make these beautiful flowers to decorate the church's altar in a residence of the Pope of Rome. 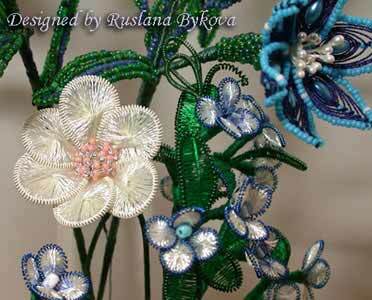 They use thin spiral wire and silk a thread in ganutell, and also beads, pearls or seed beads. Thus, very graceful, easy on weight, brilliant flowers are created. In the sixteenth century such a spiral wire of gold or silver in Italian was called "canutiglia", and in Spanish "canutillo". After the Second World War the art of Ganutell had been almost forgotten, and since 1970 the interest to compositions from dry flowers - floristics - aroused. But dried flowers were not good for ornaments in churches, so, consequently, the graceful art of ganutell was still preserved there. Later on, at the end of 1990s there was a sudden revival of the Ganutell technique. And it is quit natural, considering the fact that true ganutell is so beautiful! How to make a floret using the method of Ganutell? There is nothing difficult in it! You will need a thin wire, and also a thicker wire, threads – silk are the best, but it is possible to experiment with others as well. A thin wire about 20- 30 cm long reel up on a shoe needle or on the thinnest spoke. Even an awl will do. When it is reeled up, it is necessary to mark the middle of the spiral for convenience, then the spiral can be taken off from a needle and stretched out at length very neatly in order that the coils are on small distance from one another. After that the ends of a spiral can be cut off. The most important comes further – a thicker wire is inserted inside a spiral in order to be able to form a rigid design of a flower petal afterwards. The process of reeling up a thread on wire frame must be done very accurately. Here is when the mark, which shows the middle of a spiral, will be useful. This is the exact place, where the winding must begin from! The picture shows how it is done. Actually, this is all! Collecting the petals into the company, it is possible to create an imitation of chamomiles, daisies, and even double roses. The mid of a flower is decorated with stamens from beads or seed beads, and the sepal and a small stalk are wound by a tape for floristics or by mouline threads. The described method of winding the threads – is not unique, it can be diversified by the inventions of other methods. Skilled needlewomen sometimes use very complex methods of interweaving. But, as they say, it is already the aerobatics! Another variation of the Ganutell technique is much more difficult, it is very similar to technique of weaving the French beaded flowers. The principle of circular arrangement of wires, which are preliminary braided with a beautiful thread, is put in its basis. 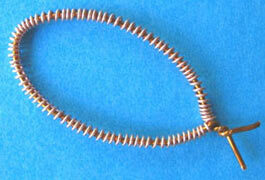 The process of braiding a wire with a thread is usually done on a spindle.. In this case a copper wire is chosen, a very thin one, in proportion with a thread – about 0.2 mm thick, or even thinner, than a thread! The steel wire is not good for Ganutell – it is not flexible. The thread and the wire should be necessarily of one and same color. Frankly speaking, the flowers made by the second method appear to make an impressing show! 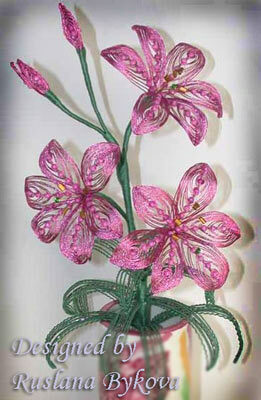 And if they are made of a very thin wire – it is simply jeweler's work! Just look what a beauty can be done by a skilled master. 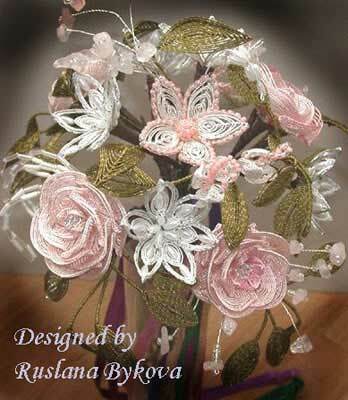 What wonderful works creates Ruslana Bikova – a big fan of Ganutell from the American city of Redmond!